In February 2015, Teach for America was invited to West Virginia schools for the first time. The first Teach for America educators are slated to arrive in West Virginia next August but only 15 educators will be stationed in the state, and Teach for America only plans to expand that number to 30-35 teachers in the next five years. Several county officials, teachers unions and education advocates have opposed the introduction of Teach for America, claiming that they do not need or want under-qualified teachers. Despite this backlash, the West Virginia education system is in dire need of educators and is willing to take on Teach for America educators. West Virginia’s teacher salaries are among the lowest in the nation, and installing Teach for America recruits is considered by some to be the cost-efficient alternative to raising teacher pay. However, critics are concerned that cutting costs may also result in cutting quality in the classroom. The article describes the background of the organization, including its successes and failures, and speculates on how well it might work in West Virginia. I assume we will read more about this (editorially, at least) in our the local "newspapers." Wallethub looks at "fattest states"
Wallethub.com which does a lot of surveys and tries to be very systematic in drawing conclusions recently compared the states to find the "Fattest States in American." When they put together their various factors, West Virginia finished third behind Mississippi and Louisiana. Factors that contributed to our ranking were: "Unhealthy Habits & Consequences" (#1), Highest % of Adults with Diabetes (#1), Hypertension (#4). Charlie Brown -- an Appalachian? Estately has done a study to find which states are most enthused about Christmas movies. Facebook user data was used to determine what percentage of users express interest in the ten most popular Christmas Movies. In the results West Virginia had the most and Hawaii had the least. Our favorite movie? I would have guessed "A Christmas Story." 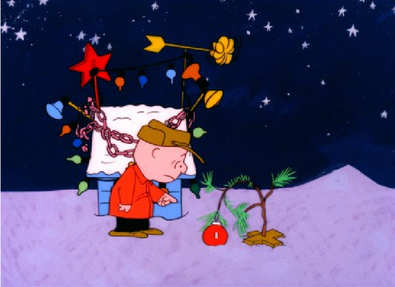 No, it's "A Charlie Brown Christmas." (A digitally remasterd version airs on ABC on Christmas Eve.) With a bit of reflection, however, it makes sense. The beloved strip always had a dark side and the unloved Charlie's fatalism matches up well with the despair sometimes found in this region.